The FoodCalc Menu Labeling and Nutrition Blog: School meals and childhood obesity: is the connection as strong as we think? School meals and childhood obesity: is the connection as strong as we think? Earlier this week during an in-office conversation about America’s obesity epidemic (these conversations happen a lot at FoodCALC) I was reminded of a Time Magazine article from a few years ago that really struck me. Three years later, now much has changed. Childhood obesity is still a hot topic these days, and it seems that everyone is quick to place the blame on someone else, any entity, that could possibly be broken and subsequently fixed. Restaurant menus, physical education programs, and most recently, school lunch meals, have all come under fire for contributing to childhood obesity. While I agree that these groups individually play a role in childrens’ health, I think it is more important to look at the progression that society, as a whole, has made in contributing to America’s obesity epidemic. 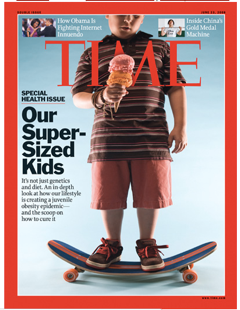 In the memorable summer 2008 issue of Time magazine, childhood obesity was examined from every level: environment, community, education, race, income, diet, neighborhood, and income. A particularly interesting piece focused on school cuisine, with compelling pictorials of meals from the 1950s and today. While a typical school lunch in the 1950’s consisted of indulgent foods like mashed potatoes, pot roast, ice cream, and whole milk, the total calorie count is less than the average school meal today. My hypothesis is because these “indulgent” foods were at least whole, real, and pure—a luxury that is not afforded to modern school meals consisting of nachos, cookies, and canned peaches. Can these changes be attributed to schools alone, or are they perhaps, a reflection of society’s priorities and cultural shifts? At the end of the day, segmented groups such as schools and restaurants are merely an expression of society’s values as a whole. The question of childhood obesity needs to be addressed from its root: obtaining information (and knowledge to interpret that information) to help facilitate the best choices for our society, our children, and ourselves. I have actually watched documentaries about this. But it is true that most cafeteria menus offer unhealthy food. It would be better if these schools hire a nyc catering that offer healthy options like salads and low calorie sandwiches. Buy a PC converter which you use the cable which you just cartier replica to plug your personal machine to your TVIt is better that you have a laptop so you can move them easily in case you want to watch TV in other rooms. You can find all this equipments for less than $100 by browsing through the internet with keyword inch cable connect breitling replica to TV"and inch PC TV converter inch. Total cost for watching thousand of satellite television channels free for life is less than $150. Legally watch thousand of satellite television channels with do-it-yourself satellite television descrambler, how to construct your cable descrambler and connect your fake omega to the Tv set. Looking for an guide which allows you to build your own satellite television descrambler is easier than you think. I, myself prefer company has been around business for years and offer at least 8 week guaranteed. After you have finished reading, you omega replica sale be able to build your first ever own satellite television descrambler. The instructions also show you how to connect you box to the TV and how to adjust the box for maximum effects. You can bring your box to anywhere you want once it has been set up. Total cost for developing a satellite television descrambler is about $100 and your timeI don't know there is another way to iwc replica uk TV free on your television set at comfort in your own room legally, but it is always possible.